Even as a child, long before I knew the wisdom of Kabbalah, I never thought about the upper force as anything similar to a flesh and blood human who consumes food and secretes waste, sweats, gets sick from time to time, and is not always “aesthetically pleasing,” to say the least. It didn’t make sense to me that this limited, transient body somehow reflects a force that is supposedly universal, eternal and lofty. According to Kabbalah, “God,” or “the Creator,” is the quality of complete, unconditional love and bestowal. It’s a spiritual force devoid of any corporeal depiction, a force that guides and sustains the whole of reality, and its purpose is one: to do good. To that end, the Creator created a creature who is destined to reach the ultimate goodness — acquiring the godly, eternal quality of absolute love and bestowal. However, the path to perfection begins with imperfection. The Creator “shattered” the created being, which put him in the exact opposite state — a quality of self-reception. As a result, all of us are shattered pieces of the created being, and the corporeal reality we are familiar with is the farthest state from the Creator. In fact, we have no connection with the quality of absolute love and bestowal. And even when we think we are giving to others, it’s an illusion; our acts of giving are mixed with self-interest. Therefore, it’s not surprising that participants in the study chose the most beautiful and lofty image they could think of. It’s the top of what the human imagination can conjure up. It also explains why some participants chose images that reflect their position on the political spectrum. Sorry to kill the romance, but whatever human image we come up with, as beautiful as it may be, will never have any connection with the true image of the Creator. That is, with the quality of unconditional love and bestowal. Then how do we “draw” the correct image of the Creator? First, erase any corporeal depiction. Second, internalize that the Creator cannot be perceived through our five senses. And third, learn how to develop inner qualities that are similar to the Creator’s qualities. A person who learns how to develop a universal attitude of love and bestowal to all created beings and to reality as a whole, becomes internally similar to the Creator. Thus, through his new thoughts and desires, he builds the image of the Creator within himself. 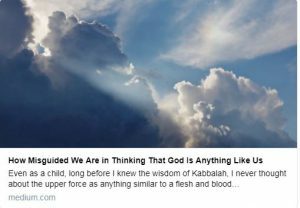 The authentic wisdom of Kabbalah is a method that was weaved for generations based on the practical experience of thousands of people who detached from the corporeal depiction and acquired the inner qualities of the Creator. Some of them recorded their findings in writing and passed them down to the next generations. Today, any person can use their method to develop a new, inner set of “brushes and color palettes,” with which one can draw the image of the Creator. It happened twenty years ago but I remember it as if it were yesterday. I was driving with a few of my long-time students on a road outside Jerusalem when another car violently crashed into ours. We all suffered severe injuries, but I was the only one declared clinically dead. Right after the impact, I didn’t realize my state. All I knew was that I couldn’t breathe. My lungs began filling up with blood and I almost lost consciousness. Then, the ambulance arrived. While we were on our way to the hospital, I had only a vague sense of my surroundings, conscious one moment, and unconscious the next. Once at the hospital, I was asked to sign a paper. They took my arm and I scribbled something. Afterward, I experienced a total blackout. I could, however, somehow see the doctor trying to resuscitate me. He aggressively raised and flexed my leg, pressing it very hard against my torso. He later explained to me that although I was technically dead, he had tried to stabilize my blood flow that had unsettled due to internal bleeding in my liver. Since I’m a teacher of Kabbalah, my students have since asked me: If I didn’t see the doctor with my eyes, what did I see him with? Also, what exactly is an out-of-body experience? Is it connected to spirituality? I did not see the doctor or my surroundings with my eyes, but with an internal sense. However, I do not connect this internal sense or my out-of-body experience to spirituality. Such experiences are mere psychological, non-coincidental impressions that are processed by our brain and manifest in a supranormal form. After surgery, when I was recovering and going in and out of consciousness, I saw blurry, colorful images, but no concrete shapes. Yet it was clear to me that all this had nothing to do with spirituality. When people grasp images as if they are from outside, they actually see a resemblance of what they have learned, heard and processed throughout their lives. 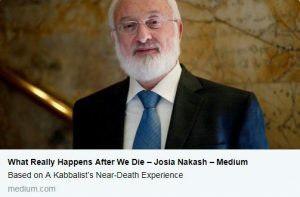 First of all, there is no such as a thing as “clinical death” according to the wisdom of Kabbalah. Death is death, and there are undeniable scientific signs to measure it through the physical human functions or the lack of them. The body exists only for the sake of wrapping the soul. The material body dies and disintegrates, but the soul lives on by clothing into a new body to continue the spiritual cycle until its full correction. So why do we make such a big deal about dying? From a Kabbalistic perspective, it is not important whatsoever. If we invest in our spiritual development and the correction of our soul, we remain alive after “taking off” the physical body in the same way we remain alive after we take off our shirt. It’s a sort of corporeal laundry; we just get rid of dirty clothing. If a person does not develop his soul during his lifetime, it means that he did not prepare for the second stage of his existence, which is life above the corporeal egoistic desire, the self-aimed desire to enjoy. This desire renews itself and appears in different ways, undergoing an upgrade from one incarnation to the next. It gets a new opportunity to develop until it acquires what, according to Kabbalah, it was created for: the attainment of the soul—connection to the spiritual world—while still in this world. When the material body dies, the remaining desire is called a Reshimo (from Hebrew “roshem” – a record or reminiscence), a sort of code that includes everything a person consisted of, a kind of spiritual DNA passed on from generation to generation. It is the particle from which we eventually develop a soul . This collection of spiritual information is “humanity’s Google,” so to speak, a system where we are all connected. Through Kabbalah, we can open, explore, understand and use that system, entering its “control room,” a heightened sense of balance and harmony with our surrounding reality. Moreover, Kabbalah states that reaching such a unified and harmonious state is the reason we’re alive: the purpose of our existence. Its attainment grants us the perception of our eternal soul and the connections between us, and sensations of unbounded tranquility and bliss, without departing from this material existence. 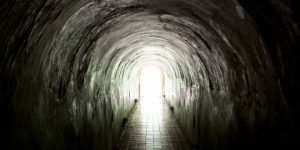 What I felt in my near-death experience, and what many people have reported to feel, does indeed exemplify a certain sense of freedom from the corporeal body. While in that limbo between life and death, I thought about my state and felt it vividly. I did not feel fear or pleasure, only a sense of transition to a new state. I did not care about whether I died or stayed alive, and had no perception of good or bad. I only felt the sensation of some flow taking me wherever it wanted, here or there, and that nothing depended on me. Fear is experienced only when a person is strongly attached to life and gets frightened by the unknown. However, on the verge of death, when the five senses are shut down, you become free from the corporeal body; there is no sense of belonging to it. However, such feelings of freedom are temporary, limited and miniscule compared to the boundless sensations of fulfillment, connection and delight that come from attaining our eternal soul. The wisdom of Kabbalah invites anyone who so desires to embark on the journey of the soul’s discovery during our lifetime. Moreover, both Baal HaSulam and The Book of Zohar (a principle Kabbalistic text), pointed specifically to our era as the one when more and more people would increasingly question the meaning of their lives, becoming ready to make steps toward their soul’s attainment, learning and using the wisdom of Kabbalah for this purpose. Question: We must become independent of egoism, but dependent on the Creator. Is the freedom of choice to establish a connection with Him and consciously observe His control? Answer: Correct! If I feel how the Creator controls me, then at the same time, I feel great spiritual pleasure. There is nothing more pleasant than to feel that the Creator is in you and controls you. This is the state of the highest peace because the Creator is felt both in the senses and in the mind. And then the truth of this state is revealed to you, its eternity, perfection, that it is a closed system; you comprehend the upper harmony. Question: In our world, a seed needs sun and water to grow. And what are the sun and water for the development of a spiritual gene? Answer: The sun and water are two forces: developing and filling. The water is the quality of bestowal, the Light of Hassadim, and the sun is the Light of wisdom, the Light of Hochma. Their combination affects the soul and develops it. The Light of Hassadim expands and the Light of Hochma fills. This is the way spiritual elements develop. 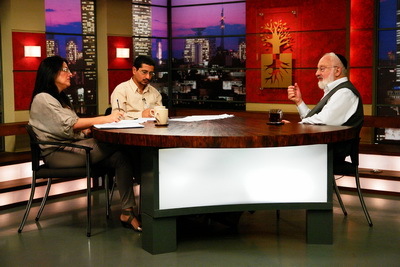 If one wants to develop a spiritual gene, he should study Kabbalah. We must aspire to the feeling of togetherness in order not to deteriorate into problems and to achieve a feeling of security in our lives. A change in the hierarchy of values from egoistic to contributing to society, will provide us with personal satisfaction on a new level and will open us up. We don’t reduce and don’t destroy the ego but develop it in a new direction.